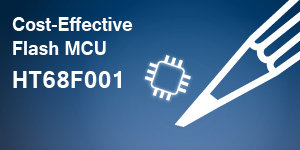 Holtek now announces the release of a new addition to its small package Flash MCU range, the HT68F001. Special features of the device include an excellent price/performance ratio, low voltage operation, low power consumption as well as an internal high accuracy Timer. These features add up to make the device suitable for use in simple product control applications but which require an accurate timing source. The device is especially suited for battery powered products as well as home appliances such as water filter elements, electric toothbrushes, LED lamps, toasters and other similar consumer products. Other areas of use could be for industrial control applications which again require an accurate timing source, such as delay switches, security detection or other types of On/Off timing control. The device has an operating voltage range of 1.8V to 5.5V and an operating current of 3μA@3V. It includes a Flash program memory capacity of 0.5K×12 and an RAM capacity of 16×8 bytes. The device also provides an 8-bit Timer and Time Base functions. The internal 32kHz RC oscillator has a high-accuracy frequency specification with a tolerance of ±1%, which can be used as the MCU system clock allowing the device to operate at a more accurate frequency and with a lower operating voltage and operating current. The device is supplied in an 8-pin SOP package type.